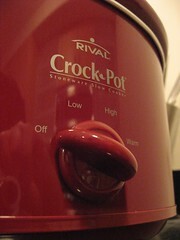 Time to warm up those Crock-Pots and start prepping something tasty for the NBHC potluck! Photo by _e.t. The next North Beacon Hill Council meeting is a special one: a year-end potluck celebration to recognize community members who have contributed to the neighborhood this year, and to plan for next year. The potluck and social will be followed by the monthly business meeting. All are welcome to attend. You are a voting member of the Council if you have attended one meeting previously. The potluck starts at 6:30 pm (1/2 hour earlier than the usual meeting time), Thursday, December 3, in the Community Room at the Beacon Hill Library, 2821 Beacon Avenue South. 8:05 – Future focus: where should we put our energy in the coming year? What are the issues the community is concerned with?